Floating markets were the theme: colourful photos showed widely-smiling ladies under broad-brimmed hats, paddling boats in packed canals, and selling exotic foods and fruit. A lovely image of course, but even the most nostalgic travellers know that the residents of Bangkok rather visit the nearest supermarket than the local canal when shopping for dinner in 2014. So it’s always a delight for visitors to discover that there are still some floating markets around though not in the heart of Bangkok. Visitors will have to visit the canals of Amphawa in Samut Songkhram province, but it’s worth it when you buy your breakfast from a boat and see the smiling ladies in big hats. 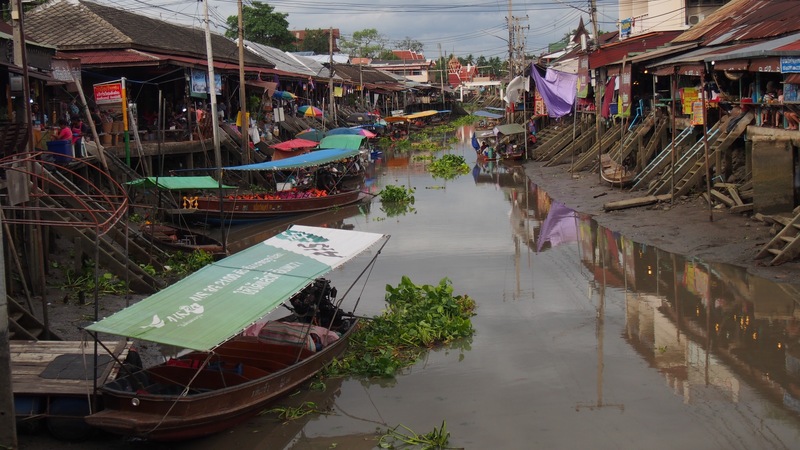 Amphawa offers a glimpse of how Bangkok looked when canals outnumbered the roads and people travelled by boat. This is where the Mae Klong River meets the Gulf of Thailand and ancient canals irrigate the region. People still live on the canals but it’s only at the weekends that the market boats come out. Amphawa Floating Market is on a bustling canal; its banks lined with attractive teak shop-houses that open to the water. Arrive early enough, and you’ll see Buddhist monks making their rounds by boat and the local people offering food and alms as they paddle by. Most visitors arrive around midday though to enjoy seafood lunches of shrimp and shellfish that are cooked on boats and handed up to diners on the bank. By evening, the canal’s banks throng with people eating barbecue and seeking bargains. Coloured lights strung along the bridges, country music and tempting smells of cooking dinners make Amphawa a delightful place to be.